On a frosty winters morning five of the Peaky Climbers brushed off the cobwebs and got back in the saddle a week after the epic Après Ski Party! With only Ben (Horse Commitments), Nobby & Stu (Still feeling poorly) missing, the Team set off bright and early at 07:00am on a 70 local mile circular route. The banter theme early on centred on Chelsea’s 3-1 victory over the mighty Arsenal which resulted in Cricky ‘throwing his rattle’ and riding solo out front most of the day as the boys meandered through sleepy villages towards Oxford & Cumnor Hill. The route then took the Team to Eynsham where they turned back and headed towards the Cotswolds via Stanton Harcourt & Bampton. Jonny B & Health & Safety (Allen) then had Peaky tiff over Team pace with JB monitoring his own pace via his heart monitor; however after a farmer’s gate toilet relief stop for Simon the boys soon kissed and made up and the bromance resumed. 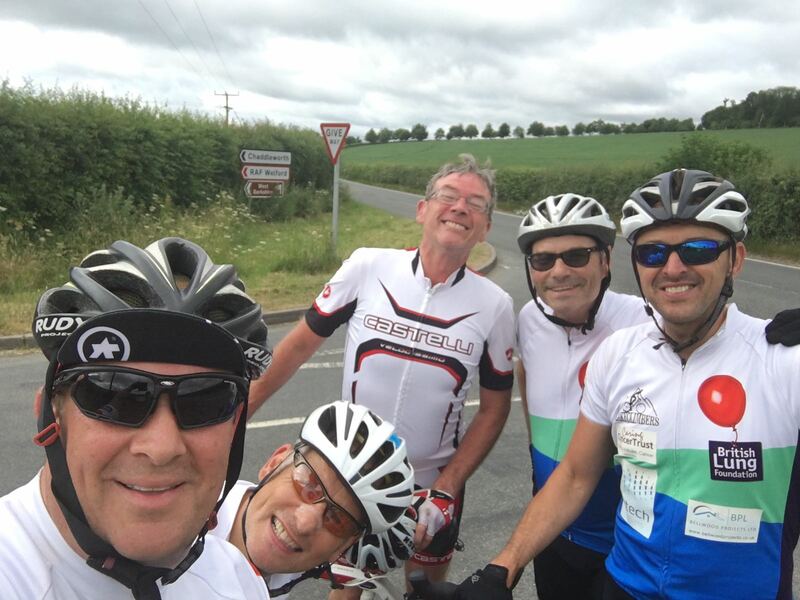 Morale took another slight dent after 30 miles when the planned coffee stop at Aston Pottery was aborted due to it being closed, but Macca gave a rally call for the riders to plough on regardless. 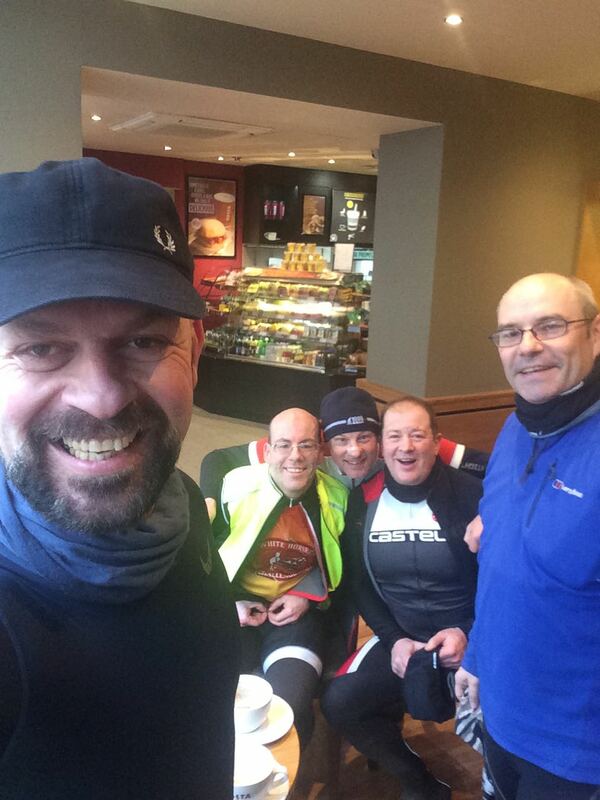 The route to Letchlade took the Peakies through Clanfield and then onto Faringdon where a well-earned Coffee was the reward at Costa. Quarter of an hour later suitably refreshed the lads continued on route out of Faringdon towards Clanfield before diverting up to Littleworth, then a quick burst on the A420 before heading down Sandy Lane towards Hatford. 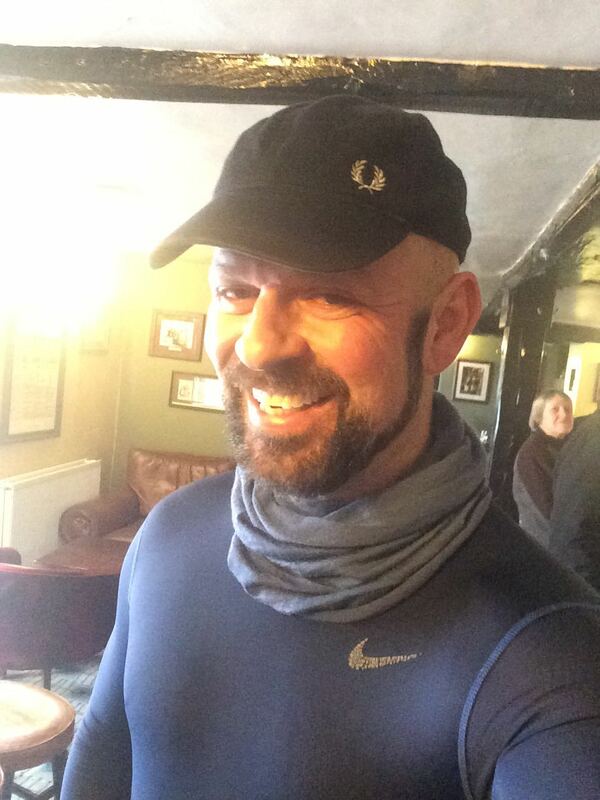 Super Simon Haly then branched off to Denchworth to see his talented son play Rugby for Glouster, this typified the Teams attitude to their training commitment as Simon still completed over 55 miles. No, this wasn’t him re-living his emotional issue a few weeks before, apparrently it was due to Macca having an emergency banana stop only 6 miles from the finish. (Anything to make Cricky smile). The fantastic four then finished with a flurry as they sped towards the chequered flag and a beer or two at the Fox Inn, Denchworth. The photo to the left shows Mr Crick in The Fox, after 3 well earned pints. As you can see his depression had lifted somewhat and he even started talking to Macca once again. The strong bond that exists between the 8 Peaky Climbers just goes to show that even when Chelsea hammer Arsenal 3-1, the animosity doesn’t last for long! A superb team training ride, which showed great team spirit and team togetherness with everyone helping each other through all the challenging aspects!